Snorkel by the Jetties on Beautiful Holiday Isle! Enjoy the sugary white sand and emerald waters on the calm waters that are perfect to snorkel by the jetties or fish/swim or just relax and feel the breeze. Undiscovered 30 unit condo complex that is close to everything in Destin yet private and perfect for families with small children. Gated community with on 3 stories. View the wildlife from your balcony or enjoy a swim in the beautiful onsite pool. 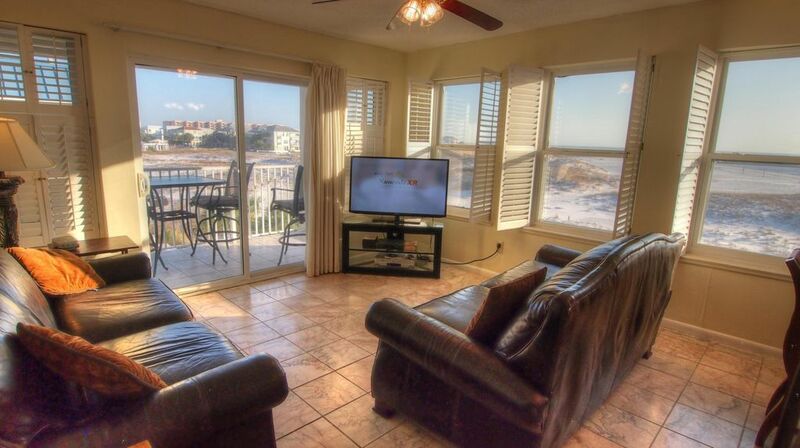 Great location, calm waters on the inlet and good waves not far away in gulf. Pretty blue water. Only downfall is it’s a decent hike to get there. I am sorry to see you go, you have been a great guest, and it has truly been my pleasure. It is always a privilege to serve our guests, and at SkyRun we take our commitments very seriously. We would certainly have it no other way. We are glad you enjoyed your stay, please come back to visit. DEPOSIT: Major Credit Cards Accepted - 1/3 of rental required upon confirmation of all reservations as down payment (min $300). Remainder due 30 days prior to arrival. PRICING: The rates above do not include 11% FL and local sales taxes, a 6% booking/amenities fee, and a $45 accidental damage waiver and the cleaning charge (varies by unit from $70-$350) which will all be added to your reservation. All of these fees and taxes ARE INCLUDED in the price quote you get from our website. Rates DO include clean linens and towels when you arrive and include a cleaning after you leave. You are responsible for cleaning during your stay. A mid-week clean is available for an extra charge during your stay. Please report any cleaning issues within 1 hour of arrival so they can be addressed. Reporting sand in your tub after you have stayed there 2 days will not be cool ;-) Until reservation is confirmed, rates are subject to change without notice.